The Master Cook Shop Event took place on the 22nd April 2010. 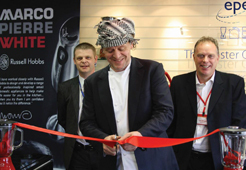 Held in EPE’s brand new product demonstration showroom with live cooking station, celebrity chef Marco Pierre White attended the opening and took part in the ceremonial ribbon cutting before mingling with guests and browsing the state of the art showroom. 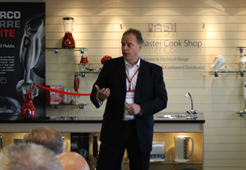 Aprils event was the showrooms grand opening and simultaneously celebrated the release of The Master Cook Shop Catalogue Edition 3. 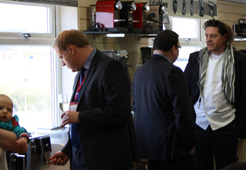 Representatives from the industry’s leading premium brands manufacturers attended the event and enjoyed our in house chef utilising our cooking station, giving live expert product demonstrations. Chef Darren Danby cooked fresh food for all our guests using the live cooking station to explore the unique performance capabilities of our brands. 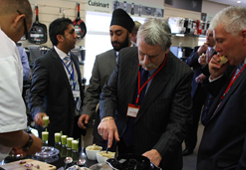 Food for the event was prepared from a specialised menu designed and prepared to highlight specific appliance features. 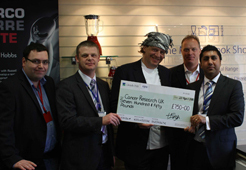 VIP Celebrity guest Marco Pierre White, EPE Managing Director Noel Pamment and Russell Hobbs Sales & Marketing Director Tim Wright. Ribbon cutting ceremony. EPE Managing Director Noel Pamment adressing the guests and commencing the event with his speech. 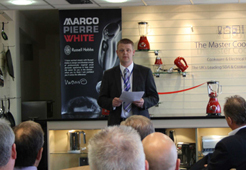 Russell Hobbs Sales & Marketing Director Tim Wright’s speech. 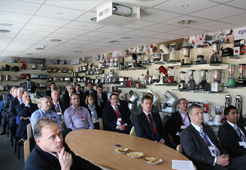 Guests in attendance at The Master Cook Shop Event on the 22nd April 2010. 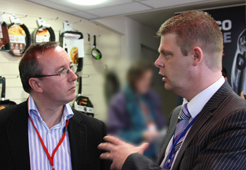 Damien Templar from Nespresso with Mike Yates European Managing Director of Jardine Consumer Solutions. 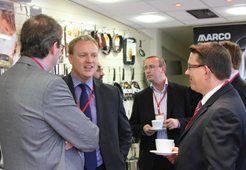 EPE’s Noel Pamment and Nigel Wainright Managing Director of Kenwood. Simon King Editor of ERT Magazine. 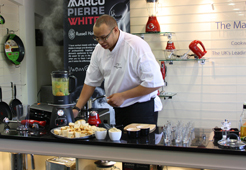 Chef Darren Danby using the new showroom’s live cooking station to demonstrate a product. 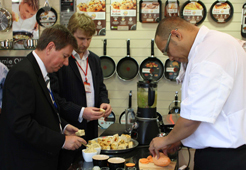 John Claydon of Group SEB and Andrew Stokes of Bosch Siemens try out the food. 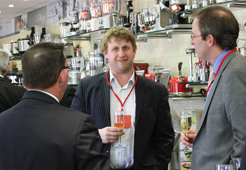 Sean Burns and Marco Pierre White discuss the full range of MPW electrical products available from EPE. Another surprise apperance, Managing Director Noel Pamment’s new born baby boy making his debut apperance at the company aged six months, bottom left. 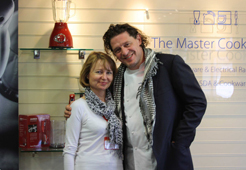 Independent Electrical Retailer Magazine Editor Anna Ryland and Marco Pierre White. North Regional Sales Manager David French tucking in, (save us some dave!). 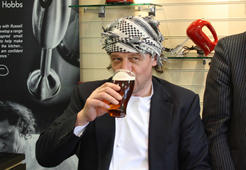 Marco Pierre White samples local Yorkshire real ale. 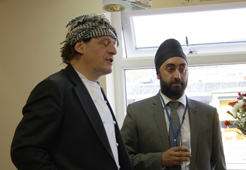 Marco Pierre White offers Kal Singh Commercial Director some expert cooking tips, (Less of the champagne Kal! ).